We are a leading Wholesale Trader of hard- top chest freezers and glass-top chest freezers from Pune, India. Keeps Food Fresh For Long, For Really Long.Blue Star Chest Freezers are the most economical yet effective solutions for safe storage of perishable foods. The range of Hard-top Chest Freezers from Blue Star incorporates cutting-edge technology and innovative features, guaranteeing long-lasting freshness. Built to last, and to meet the demands of the high sub-continental temperatures, these machines cut power bills through energy-saving innovations, helping your business grow. Just what you would expect from the Experts. 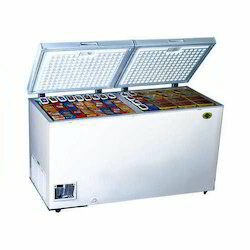 Blue Star Manufacturer & Exporters of Deep Freezers, Airconditioning Products and Ice Cube Machines in India. 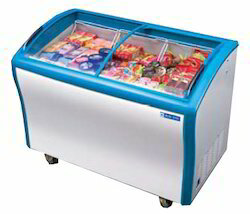 We are one of the leading wholesaler trader and suppliers of Glass-Top Chest Freezers. Display More. Sell More.Glass-top Chest Freezers offer economical freezing, storage and display solutions, all at the same time. Aesthetically crafted, they turn an ordinary display into a striking one. They are ideal for both small stores as well as modern-day large format departmental stores, and for use in parlours and eateries. The sides can be custom-branded to suit any particular product or company. With lower power consumption, these freezers present perfect solutions that save money as well. Better insulation technology makes them ideal for sub-continental climates like ours. The easy to slide glass doors also make it easy for customers themselves to use the freezer. Overall, it is a smart choice for the smart retailer! Looking for Deep Freezers ?